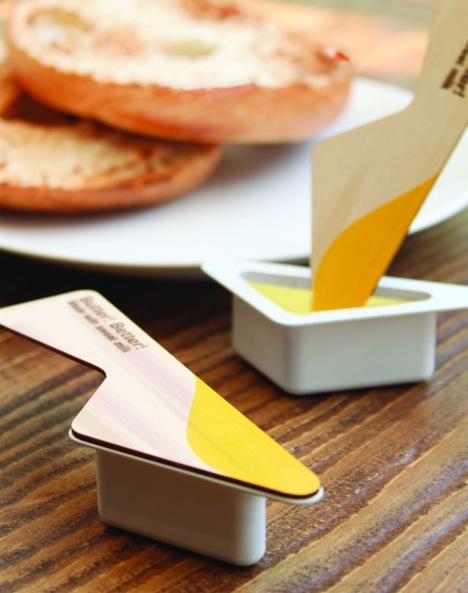 Maybe you could argue that by using this spreader you could eliminate the need for a butter knife, so you would save water and energy by not having to wash as many utensils. But in most places, you are going to use your normal knife for butter purposes anyway. I think I fall on your side of this one. I can see those knives snapping a lot, especially when a restaurant gives you a frozen butter container. I hate to play the overprotective mother card, but does this product strike one as unsanitary? A part of the spreader doubles as package exterior, exposed to the world. If the purpose of the packaging is to keep contaminants out of the food, then it is poor form for the exterior packaging to come into contact with the food.